Highly recommend that you NOT try to move them yourself. I'm going to agree with this statement. Odds of you damaging the speaker(s) and or you getting injured are much higher than they need to be.... Pay the delivery guy to help you if possible (I've had several guys help me and tipped them without incident). LaScalas need space. Base needs room to develop and mid range needs room to mellow. Ideally 16 feet minimum in my opinion but you gotta work with whatever you have. I know others may not share my opinion but that’s just been my experience since 1977. If you are close to Wilmington, NC I'll give you a hand. Definitely do not attempt this alone. You can never undo the damage once it's there. I'll say it once again... it can't be done, or certainly shouldn't be. I believe @dwilawyer showed a pic of the new LS II with an AK-5 XO. The AK is usually associated with the Khorn, the AL with the LS. Is Klipsch really putting an AK-5 XO in a La Scala? I've moved (scooted) CF-4's at 108 pounds up and down stairs by myself by scooting them, but they are not nearly as wide as the LS. Total speaker weight is 175lbs with the bottoms being 100-110lbs in my estimation. Those base bins are heavy and bulky. Definitely need a dolly. How can they possibly weigh the same as a pair of klipschorns? not sure but that's what the spec sheet says. I thought the same thing, but I'm behind the times. I'm guessing it's because of using heavier MDF instead of wood but the LS II weighs 175 pounds and a new Khorn weighs 220! I put my LS ii upstairs. I would guess the bass bin at 140. The top is light. It is small and 3/4”. I piss anted mine with a strap. But used to move piano’s and safes for a living. They are too large to bear hug. You need a strap to get them on your back. Anyone that thinks a 100 pounds is this thinking LS i. 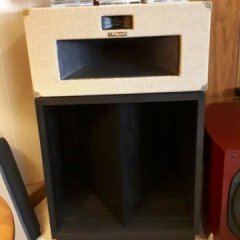 The LS ii bass bin is a load. 175lbs. Both weigh the same according to spec. sheet. So depends on which one your buying. Call Cory he could probably tell you how much each section weighs and give you a good price on any of them. I wonder if there is going to be 2 models of each because those newest ones are crazy prices. I bet they dont sell many of the newest ones but that may be their plan. I dont know anyone who can afford the current ones let alone the newer ones. No price on the newer LaScala. Practice by carrying your mother-in-law up the stairs. If she makes it unscathed, you can handle the LaScala's. Most definitely a two man job. If you can get an appliance dolly and your good with it and it's a straight shot, then it shouldn't be a problem. It all depends on the person and their tools. I knew an old man in his eighties that built a wooden slide for his basement stairs somehow there was an electrical winch involved and he could move washers and dryers and deep freezers up and down those stairs. This is what I did, save yerself some grief. Yer still gonna have to do some head scratching and maneuvering to get them unboxed and in position in that room. I carried my Cornwalls down to the basement to do the Cornscala conversion by myself. And I only weigh about 135lbs. Find a mover on craigslist or from a local Uhaul or other source. Have them come to your house and give them $50 to carry the pieces up your stairs. I hired 2 movers to unload a Uhaul I had packed myself and driven across the country. 2 guys took 30 min to unload a packed truck including a single k-horn that was disassembled but still had the components installed. A small guy, maybe 140lbs, picked up the bass bin and carried it off the truck, down a ramp and into my place. Professional movers know how to get chit done. Best $100 I've spent in a long time. Moving La Scalas, whether 1st generation or LS2, is a 2-man job. The speakers aren't just heavy, they're bulky, and they don't have any handles. Imagine moving a washing machine up stairs, but instead of enamel-painted steel, it's covered in lacquered walnut veneer. And then you have to move the second one up those same stairs, but now you're a bit tired and maybe a bit careless. You really don't want to get any marks on those fine speakers, because you'll be kicking yourself for years if you do. When I bought my La Scala IIs, they were up a flight of stairs with a turn, and then around a corner. Once I satisfied myself that they sounded great and paid the owner, he was lucky to be able to have his neighbour come over and lend a hand. Those two big strapping guys got them safely down the stairs and into my van. Fortunately, he still had the boxes they came in, so that protected the speakers, but made them more bulky. Naturally, it was easier to take them down the stairs than it would have been to go up. Apart from the safety of the speakers, your own safety matters. If anything goes wrong and you and the speaker go down the stairs together without intending to, you and it will be in rough shape. It would be a really good idea to get some pros to move them, even if it costs you some money. The stakes are too high to have something go wrong, especially considering the price and value of the speakers. As for their size, La Scalas and LS2s do work well in nearly any size of room. The general rule on this forum is that if the speakers fit through the door, they're not too big for the room. And even then, exceptions can be made, like if the door needs to be removed. As well, you may have a bigger listening room in the future, and you'll already have the speakers for it. If you exercise some restraint with your listening levels, your neighbours should have nothing to complain about. In my case, I normally listen at sensible levels. If I want to turn it up loud for a bit, I do it in mid-afternoon, when there are fewer people at home to be disturbed. The subwoofers can be the actual culprit when it comes to annoying neighbours. To prevent that, none of my subs (2 in the bedroom, 1 in the living room) are sitting on the floor. All of them are sitting on cabinets or tables, and also sitting on 1/2 inch or 3/4-inch-thick neoprene pads (pipe insulation). The subs sound great (floor reflection is not a factor with their raised positions), but very little of their sound gets transmitted into the floor, or into the apartments downstairs. The system is capable of extreme volume, but I've never had a noise complaint, even after nearly 15 years of happily listening to the system.